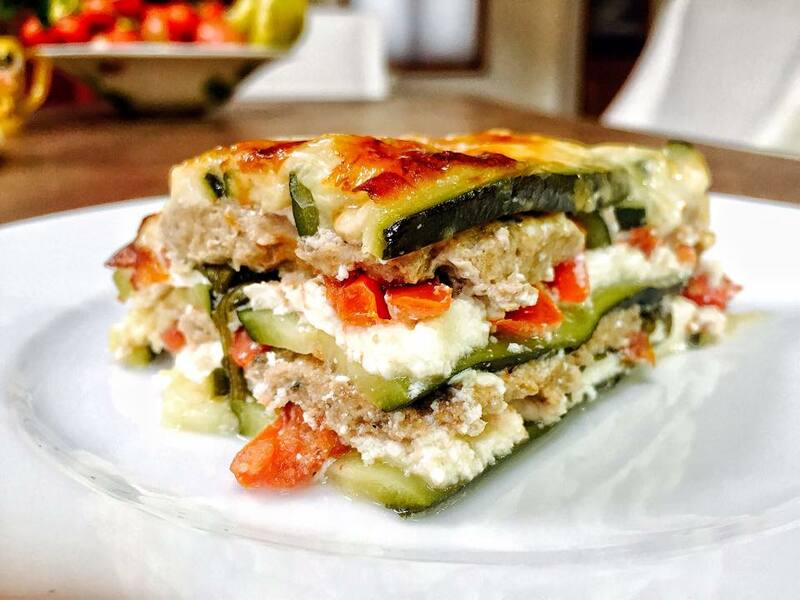 Leaner Tip: Substitute lasagna pasta with sliced zucchini to reduce recipe by ~160 calories per cup. Mix the turkey meat with all of the spices and salt. To create the zucchini lasagna pasta, slice the zucchini vertically with a 1/8″ width. You will need about 15-20 pieces. First layer the bottom of the pan with the zucchini slices, secondly add and flatten out 1 cup of ricotta cheese, add your tomato slices, add about 5 oz of the ground turkey, and repeat the layer process. Lastly, add the parmesan cheese as the last layer. Place tin foil on top of the lasagna but keep it loosely wrapped to let some of the water evaporate. Take the lasagna out of the oven, remove the tin foil, and drain out excess water from the pan. Put the lasagna back into the oven for another 20 min (without the tin foil) until the cheese turns to a golden brown color. Remove from the oven (you may need to drain out the excess water again) and let it sit for 10 min before serving.